Self pollination is defined as the transfer of mature pollen grains from the anther of flower to stigma of same flower or to that of another flower of the same plant. So, this whole process is termed as Self pollination or Autogamy (auto – self, Gamos – marriage). For example in Pea, Cotton or “Tomato. Self pollination takes place in bisexual flowers only and never in unisexual flowers. Even in bisexual flowers there are often certain mechanisms which wholly prevent self pollination. The progeny resulting from self pollination gradually become weaker, and it is therefore, less frequent than the cross-pollination. Some plants have devices which help in self pollination. 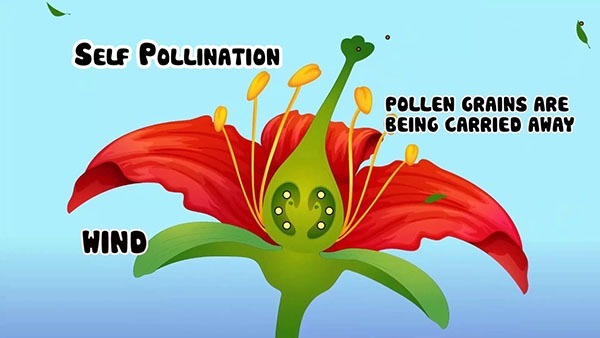 The self pollination is mainly divided into two types. The first one is termed as Homogamy (homos – the same) while second one is called Cleistogamy (Kleistos – closed). The cleistogamy is also known by another name closed flower. (i) A gentle breeze might shake the mature anthers which then shed their pollen grains onto any ripe stigma situated below them. (ii) Insects may visit the flower for its nectar and carry mature pollen grains mature stigma of the same flower. (iii) As the anther mature, the filaments of the anther recoil and bring the anthers close to the stigma. The anthers then burst and discharge their pollens right on the surface of the stigma, bringing about the self pollination, as in Mirabilis jalapa (Gul-e-Abbasi). The reverse is also true in some cases, e.g., in some members of Compositae and Malvaceae. The stigmas themselves may bend over and come into contact with the anthers. (iv) The anthers may initially be situated above the stigmas as in the case of tubular flowers (Gardenia) whose anthers are crowded together at the mouth of the corolla tube. The mature stigma pushes their way out of the corolla tube and they brush against the anthers and collect pollen grains. Cleistogamy Definition: Some small, inconspicuous bisexual flowers never open at all. They are known as Cleistogamous or Closed Flower. Ripe pollen grains are discharged onto the stigmas. The both anthers and carpels ripe at the same time. This condition is called Cleistogamy. 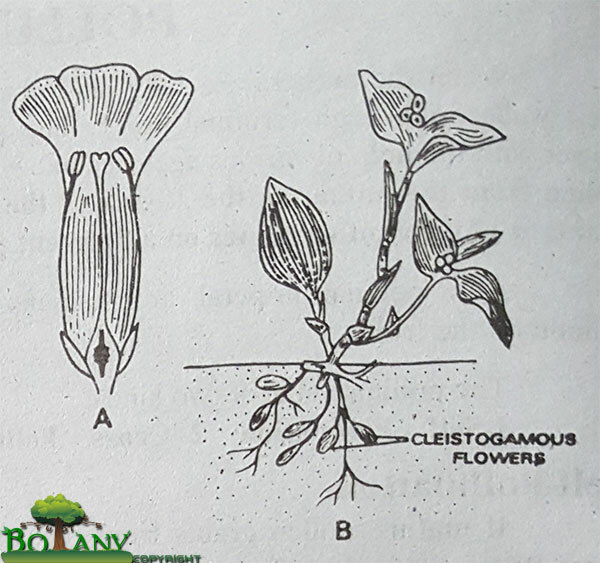 Cleistogamy is generally accompanied by Geocarpy (Extremely rare plant reproduction in which the fruit formation is underground means inside the soil. The fruit production and ripening is under the ground). In such cases the cleistogamous flowers arise on underground shocks. Cleistogamous flowers are without color and they do not secrete nectar. Cliestogamy is found in some species of Imaptiens, Oxalis, peanuts, peas, pansy, grass family and a cleistogamous plant known as Viola etc. There are different types of plants, flowers and including crops which self pollinate. 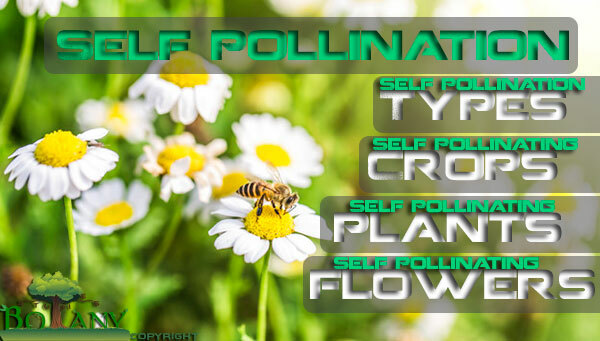 Here are some examples of self pollinated plants along with self pollinating flowers and self pollinating crops. Genetic uniformity in populations is maintained and parental characters are preserved over a considerable period of time. As compared to cross-pollination, it is highly economical method as it tries to conserve energy which might have, otherwise, been utilized in the production of more pollens grains, nectar and accessory structures. It is one of the chief methods to obtain homozygous individuals particularly in plants where anther culture has failed to yield haploids. The resulting plants are pre-adapted to the prevailing environmental conditions. Additional characters cannot, by themselves, get incorporated in self pollinated plants. With passage of time self pollinated plants become more susceptible to disease. Also, seed production is also affected. It is not possible to get rid of any undesirable characters.